Arone Meeks was born in Sydney in 1957, but grew up in Cairns before returning to Sydney to attend art school. 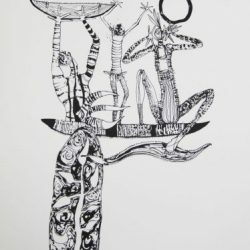 Meeks has been proactive as a founding artist with the Boomalli Aboriginal artists collective in Sydney and initiating the annual NAIDOC exhibition at the Tanks Art Centre in Cairns. These activities create dialogue between communities and showcase what indigenous artists have to give. He has been awarded significant fellowships including the first indigenous Australian residency at Cite des Arts in Paris. Arone grew up with his initiated grandfather and spent time with one of the North’s most celebrated indigenous artists Thancoupie, who, he describes as ‘Athoy’- spiritual mother. He has lived with the Mornington Island community, finding strength in belonging to its social foundation. Arone produces paintings, sculpture and prints that express a passion for country, spirituality, sexuality and politics. His path is one that redefines his connections through art mediums. The spiritual is actualized through art and his response is one of ‘working it through’ an intuitive process. Arone is able to express a unique spiritual response to country that has a harmony in connecting disparate worlds. His subjects are sourced in nature and represent a cultural responsibility with an expression of contemporary art. 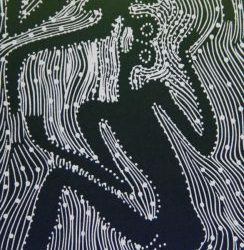 Arone’s indigenous links are with the Kokomidiji of Cape York, around Laura, the site of renowned rock art galleries filled with graceful drawings of quinkans. Laura is known as a place of Aboriginal magic and sorcery; it is also the location palpable effect on Arone. He feels a physical reaction to sacred country that helps forge relationships with kinship, a sense of self and ‘renewing the dreaming’. 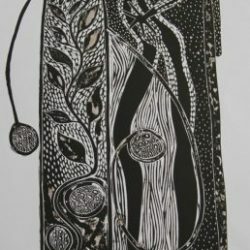 Arone’s art is not governed by the same barriers and protocols that govern traditional Aboriginal art, but is placed in the context of the contemporary urban. Arone’s practice is based intuitively on the shifting definition of cultural identity. It is one that has a connection to dreams and experiences that have touched his soul. Sexuality has an influence and is conceptualized as part of the human matrix. 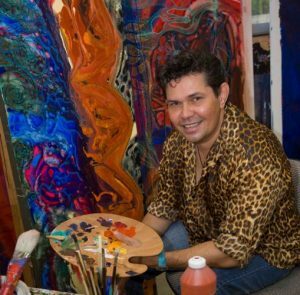 As an urban aboriginal that inhabits a world in proximity to traditional tribal lands and communities, he describes his practice by saying, “I am hunting for lost pieces of myself.” It is a process where imagination comes from within and possibly an inexhaustible source for his art. For Arone the process of painting is great therapy for defining self and existence. He finds humanity in the gesture of the mark and this is evident in much of his work. His art objects are like his children, sent off into the world, and like children the finished objects take time to reveal their full consequences to him. 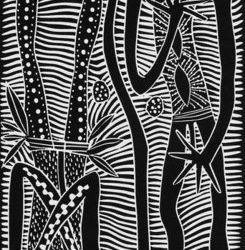 Traditionally from Laura, Arone is a Cairns based artist of both national and international repute. His new series of works explore spirituality as a merging of both the traditional and contemporary through paint and print. For Arone this new series of works forges the connection between intellect, spirit, man and environment. The practice of physically producing this body of work strengthens the link with country on both a personal and broader level. Metaphorical links to the colour blue and the lung symbols combine in their significance relating to inner spiritual essence and the power of spiritual transformation. Physically the ‘blue’ lung represents his geographical source of inspiration and natural breath. In form Arone has been exploring new techniques in paint and medium relating to traditional methods of mark making. An accomplished printmaker he has also produced large scale lino and mono prints in both black and white and colour.